Irrisen, Land of Eternal Winter presents a comprehensive overview of this frigid kingdom, where the imperious control of the ruling class stifles the residents just as strongly as the harsh, never-ending winter. A detailed exploration of the nation of Irrisen, from the icy fey stronghold of Feyfrost to the frozen forest of Harwood, including an extensive timeline of Irrisen's history and notes on traditional Irriseni holidays. Detailed maps of Irrisen's six provinces and half a dozen of its most important towns and cities, from Queen Elvanna's capital of Whitethrone to the industrial town of Morozny. Complete stat blocks for each of Irrisen's provinces and their capitals, detailing major settlements and notable denizens. Numerous sites and events where adventure can be found, as well as hazards and afflictions that threaten visitors to these snowy lands. A bestiary of new monsters and NPCs from Irrisen, such as Baba Yaga's Three Riders, the boreal creature template, and sample winter witches. 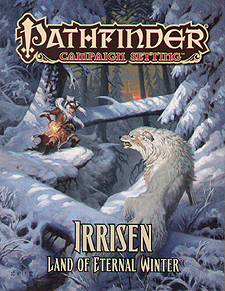 Irrisen, Land of Eternal Winter is intended for use with the Pathfinder Roleplaying Game and Pathfinder campaign setting, but can easily be used in any fantasy game setting.